The Port Huron High School Class of 1963 Mail Box. If you would like, we could post your message and email address on the web site in graphic format. This is a spam deterrent mechanism. Send your message to Len Patterson and he will post it as soon as possible. Please indicate whether or not you want your email address posted on this page. Submit your request to post your message and/or e-mail address on this page. Please add Len Patterson's email (lgpatterson) to your address book. Update messages are getting "recipient rejected" error message. When my American family (the Davidsons) informed me long time ago that the reunion was coming up I knew I had to come! My year with you guys at the PHHS 62-63 has often been on my mind with the exception when I gave birth to my two daughters!!! When I play the ukulele given to me by my scout troop in PH, and also when: I try to sew and mend things like Mrs. Harriet Davidson always did, and also when I attend parties at the American Club in Stockholm. I am coming with my husband Ulf (since 35 years) and we will be travelling a little after the reunion in Michigan and later also to Canada. I am looking forward to seeing you all at the parties and dance the line dances again (I have not danced line dances since my last reunion 25 years ago)!!! Love to you all, until we meet at the party! Ralph, who married Eileen in 1991, are retired educators for the State of Delaware, where they still reside in one of the 25+ houses Ralph built before 2000. Our combined family includes children, Monica, Scott, Elisa, and Derrick and 5 grandchildren. Elisa and Derrick have given us 3 grandchildren; Zachary Jacob, Elana Brynn, and Skyler Eli Combs (Zachary was born in Germany where Elisa and Derrick were stationed with the Air Force.) You may remember that Ralph served in the Air Force in the 60's. Monica's two children are Riley Marianna and Mason Reese Buchman. Ralph's many talents, including his distinguished bird-carving, has been curtailed by Parkinson's disease. Ralph, an avid classic car enthusiast, still has a full head of thick wavy hair and a beautiful smile above his nearly ever-present tan. Great reunion last night - just ended too soon!! My husband & I had a great time - he's from Avoca, Mi & graduated in 1962 from Yale Mi - but we'll forgive him for that! We had problems with a mail hacker in the spring, so had to redo our email account & forgot to add my email request to you. Hope to hear from some more classmates - we are in Ortonville, Mi until Nov 1, then off to Port Charlotte, Fl where I teach line dancing until April when we'll be back to Ortonville. Leonard, thanks for your concern for my well being. The heart Doc. said my heart is doing well and those (2) light heart attacks did not take place. Go figure - PRAISE THE LORD!. I have a boyfriend ... Got off the internet. I have 20 acres and it (the computer) was robbing my time and I was playing too many games, wasn't getting my yard work done or house work. So, I gave my printer & computer to my granddaughter. I have never felt better. I guess it just took a boyfriend to give me a zest for life. Amazing what you guys do to us. Say hi to all for me and the best of health to you too. P.S. You can share the news to my friends. I want you to know, that I am not missing in action! Since I "have to" attend a wedding of my daughter in Switzerland in July, I am not able to join you at the reunion. I wish you very much success and a very pleasant time. Some of the names in the list I recall quite well e.g. Karen Bloxom, Larry Butler, Chuck Carr, Dave Dunn, Mary Fenner, Dale Jurk, Joanne King-Westrick, Mark Sokoloff, Holly Ulmer - and of course my fellow-exchangestudents Maj Alvinger-Bergman and Connie Ruebig-Schecker. It would be so great to hear from old friends near and far! There are so many people I have thought of over the years and have wondered about. So get in touch, y'all!!! Hope to see all my 1963 classmates at our 50th high school reunion. Since graduation, life has taken me through 11 years of college, jobs in Pennsylvania and Florida, before finding my niche and spending thirty years as legal counsel to The Coca-Cola Company in Atlanta, Georgia. All that came to an end in 2007, when Leslie and I retired on Hilton Head Island. Although it�s been (almost) 50 years with virtually no contact, I was amazed to recognize and remember over 60 of my classmates from our 1963 yearbook. Sadly, a few have passed away; but lots and lots are still with us. I look forward to seeing all of them for our 50th reunion. You may post my email address on the website. Regretfully "Skip" passed away Feburay 2016, but you can contact his wife, Joanna at this same email address. Looking very forward to seeing lots of people at our 50th reunion next July 27. Plans are being made, friendships are being rekindled and we are all getting excited. Please check the web site, or our FACEBOOK page (Port Huron High School 1963) for details as they become available. Also watch your mailbox for invitations in 2013. I would also like to give Sharon and the committee a big thank you for the job well done. I would also like to thank Len for the outstanding job he has done on our web page. He has put a great effort into it to see that everyone was informed. It is a lot of work and time. I must have slowed down because there was a few classmates that I didn't catch up with. Maybe next time it should be a four day for us old people. Live today because tomorrow is not a given! Please post and thanks to all again. Sorry I will not be attending the 50th reunion but wish all a good time. Had a great time seeing classmates at the 45th. Hope to see many more at the 50th. Thank you John & Sharon and the committee for your efforts. Please add my email address to your webpage for others to see... S. O'Neil Kopp.... mentioned that there were usually a couple of day of events. Thanks for everything. Amazing job on the web/information pages. I hope that this web page proves useful for all of the classmates as the reunion is fast approaching. Sue and I plan to be there. I wouldn't miss it no matter how old and fat I may look. These times do not come often enough. Len, please post my email and home address on the message board. 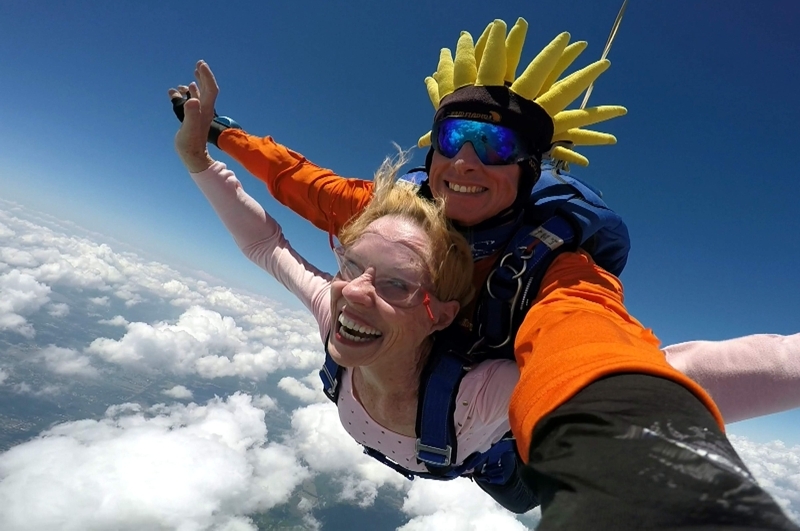 Click here to see Photo for my 70th Birthday jump! Click here to see newspaper article about my other exploits! Please note, that the email address is made up of "zeros" NOT "OHs". I am sorry to write this but Bill has passed away. In September they found a brain tumor and removed it. He then had chemo but after 2 treatments the cancer was back and growing fast. He spent the last 5 months in the hospital and VA care center in Phoenix. They took wonderful care of him and he did not know where he was or what was going on. I went everyday to be with him and most of the time he knew me, so after 39 years of marriage I said goodbye Saturday 24 of January at 6:45 p.m. He is being cremated this week and will be buried in the VA cemetery in Phoenix. There is no funeral as he did not want one, but I wanted you to know what happened to him. NOTE: Please ensure CALLER ID is not turned off when you call. ©2008-2017 PHHS Class of 1963 Web Site. All rights reserved.